SAP C4C Technical Online Training offered by SAPVITS imparts enlightenment on the end-to-end sales process flow and other essentials of SAP C4C platform that is important for aligning the organizations to the customers. The SAP C4C Technical Online Courses have been designed to provide a complete administrative of the organization so that the candidates would be able to understand the functionalities, feed, shelf, tag, follow of C4C. At SAPVITS the SAP C4C Online Training provide through experienced trainers, who help them in gaining the complete acquaintance on the SAP C4C platform that enables managing the Accounts, Market, Workflow, etc., however, there are lots of other essentials as well that helps the candidates in understanding the roles and authorizations of a professional. SAP C4C Training helps in dealing with the organizational issues related to clients and customers. The SAP C4C Technical Online Training helps you to acquire a deep level of integrated knowledge in SAP CRM, SAP ERP, social features and mobile interfaces. With this course, you will learn how to integrate SAP Hybris Cloud for Customer based on CRM application with other SAP solutions such as SAP ERP, SAP HANA Cloud Integration. SAP Cloud for Customer (SAP C4C) is an advanced version of SAP CRM module and gives alternative solution for Sales, Service, and Social Engagement. SAP C4C is a software as a service (SaaS) platform that is integrated with SAP Cloud for Sales and SAP Cloud for Service modules.SAP C4C runs on the HANA Cloud Platform and reinforces SAP’s commitment to its Cloud solutions more than the on-premise ones. SAP C4C is prepacked with integrations to SAP ERP and SAP CRM, Mobile interfaces, strong social features. The entire product is a combination of a browser-based Silverlight UI, Integrated social features of JAM, Set of rich SAP C4C Mobile apps for iOS & Android, SAP HANA for Integration scenarios. Why SAP C4C Technical Course? SAP C4C Technical Online Training helps you configure SAP Hybris Cloud for Customer for integration with SAP ERP. This also helps you with the right technical proficiency for configuring SAP HANA Cloud Integration for integrating with SAP Hybris Cloud for Customer and SAP ERP. The course also explains SAP SRM configuration steps for integrating with SAP Hybris Cloud for Customer. With this course, you would be able to articulate pre-packaged integration flows available for SAP CRM integration with SAP Hybris Cloud for Customer. It gives you adequate knowledge on executing common integration scenarios, determine connectivity and configuration strategy for your cloud project and extend standard integration scenarios. • Knowledge of integration scenarios available with SAP Hybris Cloud for Customer. • Detailed knowledge of implementation, configuration, and migration of data for C4C. • Use the SAP Hybris Cloud for Customer administrative functions to effectively manage the needs of the business. • Translate customer business needs into best practice business scenarios in SAP Hybris Cloud for Customer. • Set up and configure the solution to manage business processes. • Describe the integration scenarios available with SAP Hybris Cloud for Customer. 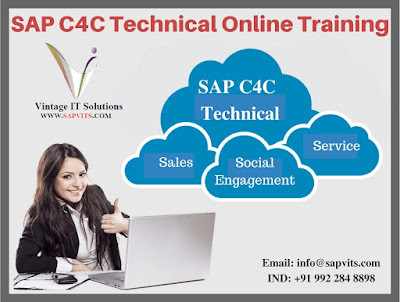 SAPVITS offer SAP C4C Technical Online Training in Bangalore, Hyderabad, Chennai, Pune, Mumbai, India, Canada, Singapore, Malaysia, UK, and USA. We offer SAP C4C Technical Training with complete solution by providing SAP C4C Training Material in PDF, PPT format. It includes SAP C4C Overview, architecture, services & integration. We offer free SAP C4C Demo session. Enroll with us for SAP C4C Technical Online Training and learn how the SAP updates C4C mobile application with new functionalities.